The Postgraduate Research Travel Awards enable postgraduate research students to enhance and to gain new perspectives on their work through travel in Australia or overseas. The Awards were established to mark the 75th Anniversary of the University, and have since been supported by the generous donations of graduates, with assistance from the University Research Committee and the Postgraduate Students' Association. Postgraduate Research Travel Awards allow recipients to defray up to $3000 of travel costs related to their research. The award is paid as a reimbursement upon presentation of original receipts. 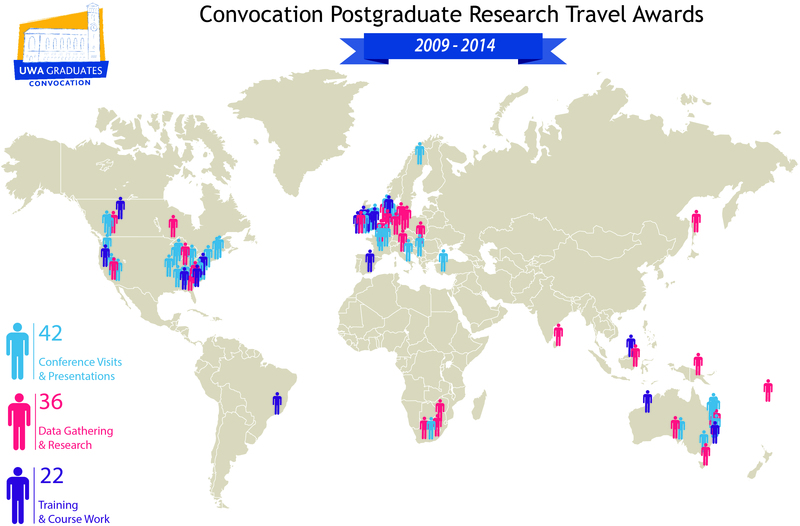 The recipients of the Convocation Postgraduate Research Travel Awards are going places! A combined 50 times around the world over the past 5 years. How can a Postgraduate Research Travel Award help you? Viviene Brown is a Masters student in Archaeology. She was awarded a Postgraduate Research Travel Award in 2012, and used the funds to bring together members of the Wajarri community for a consultative workshop. "Moving into the future, I'd really like to do a PhD, and the Convocation Research Travel Award has helped to make that a possibility," she said. "I need to maintain the collaborative partnership that I've developed with the Wajarri traditional owners, and that's what the Convocation Travel Award has given me." 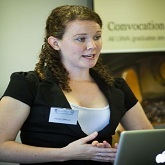 Zarin Salter, having completed a Marine Science (Honours) degree at UWA in 2006 followed by a PhD at UWA in 2012, first appreciated the significance of Convocation when she won a Postgraduate Research Travel Award in 2011. "It was an incredibly valuable experience receiving the Award from Convocation," she said. So impressed was she with Convocation’s role at UWA, Zarin decided to stand for Convocation Council and was elected a Councillor in March 2013. Foteini Hassiotou won a Postgraduate Research Travel Award in 2011 which allowed her to travel to the University of North Carolina, where she spent a few months working on different aspects of breast milk stem cells and breast cancer, expanding her research at UWA. "That was a great experience, a really enriching experience, so I am really grateful to Convocation that I was able to do that through this Award," she said. 2008 Winner Holly Clifford Applications for the Postgraduate Research Travel Awards are now open! To be eligible to apply for an award, an applicant must have been enrolled for a higher degree by research at this University for at least six months and have had their research proposal accepted by the Board of the Graduate Research School. Applications must be submitted on the form below before 4:00pm on Friday 6 June 2014. Applications for the Postgraduate Research Travel Awards Open on 4th April 2016 and close on 3rd June 2016. To be eligible to apply for an award, an applicant must have been enrolled for a higher degree by research at this University for at least six months and have had their research proposal accepted by the Board of the Graduate Research School. Applications must be submitted on form below before 12:00 noon on Friday 3rd June 2016. Applicants must provide the originals of the above, along with six copies of all application materials, and a single passport photo. An Awards Ceremony is held each year for the presentation of the Postgraduate Research Travel Awards and the Matilda Award for Cultural Excellence. The Awards Ceremony for 2015 was held on the 15th of August 2015 in the Banquet Hall of the University Club of WA. Twelve Postgraduate Research Travel Awards were awarded. "Research of flood adaptation projects in Sao Paulo, Brazil, examining how they are conceived, implemented, and contested by multiple stakeholders in a context of uneven power relations". Funds will be used to travel to Brazil to conduct fieldwork, interviews, observations and to visit the National Institute for Space Research to present research and to attend a course on Spatial Analysis of Geographic Data. "Study of plant RNA editing factors for the development of precise gene modification tools with agricultural and therapeutic applications". Funds will be used to attend the Gordon Research Conference on RNA Editing in California; Visiting the Barkan Laboratory at University of Oregon. "Development of a clinical survey evaluating hearing aid handling and management will facilitate identification of deficits in hearing aid skills, leading to improved training programs and higher rates of hearing aid success". Funds will be used travel to Vancouver to present her work at the World Congress of Audiology and to meet with and to further develop her relationship with one of her PhD collaborators. "To examine economic policies that reduce the negative impacts of petroleum price volatility in oil exporting economies through economy-wide modelling". Funds will be used to attend two conferences and to present two papers. Also to visit other institutions in UK and Kuwait. "The role of stress and relaxation in the regulation of appetite, and the consumption of energy-dense, nutrient-poor food". Funds will be used to attend teacher training programs in Mindfulness Based Stress Reduction (9-day intensive Practicum in MBSR) held in New York and Massachusetts. "Research of primary school leadership in the Republic of Serbia as a society undergoing democratization with a particular reference to the historical background, recent developments and current concerns of primary school principals". Funds will be used to conduct fieldwork in the Republic of Serbia and collect data in the form of documents and interviews. Also to take part in the biennial conference hosted by the European School Heads Association in Maastricht, the Netherlands. The importance of indigenous knowledge and practice in managing freshwater resources and freshwater ecosystems; 2 case studies from the Dampier Peninsula, Northern Western Australia. α-phellandrene – indoor smog chamber measurements and modelling. Studying magnetically activated drug release. School of Medicine and Pharmacology, National Centre for Asbestos Related Diseases. The identification of tumour neo-antigens in malignant mesothelioma using next generation sequencing. Stabilised transmission of high-precision reference signals for use in high-precision space-science and fundamental physics research. Defective cell migration as a mechanism of dysregulated asthmatic airway repair. Using new automated technology to improve access to hearing services in rural and remote areas of WA. Verification of genetic risk factors for sarcoma. To explore the physiological, biochemical and molecular mechanisms of delayed leaf greening in a phosphorus-use efficient plant Hakea prostrate, in order to increase the sustainability of farming systems. Assessment of musculoskeletal properties in children with cerebral palsy and the impact of botulinum toxin type A. How do your genetics and your experience of stressful life events impact, your stress response and chance of depression/anxiety in later life?. School of Earth and Environment, Marine Science. Governance of marine protected areas and prospects of marine ecosystem-based management in the Arctic. Modelling urinary toxicity following external beam radiotherapy of the prostate. Project aims to measure and model the energy output of the universe over the last 7 billion years. Novel pharmacological therapy for pleural infection. Observations of acoustic reflections in an ultra shallow water environment of depth less than 2 M using a compact phased array. Payment for eco-systems services and the Brazilian ICMS-E: an exploration of environmental policy outcomes. The feedback loop between the space industry and popular culture through a study of relevant institutional and private archives, to articulate the cultural role that space exploration has played upon modern culture, spawning new fields of research, such as space architecture. Applying next generation DNA methodologies to the discipline of forensic entomology which will aid in the crime solving ability of law enforcement agencies. The transdiagnostic theory of eating disorders and associated enhanced cognitive behavioural treatment. Registration of whole-body CT images using the non-linear patient-specific biomechanical modelling. Study of star formation in different environments of nearby galaxies, specifically low stellar-density regions, to gain a better understanding of the formation and evolution of galaxies. Investigating population genetic structure and health husbandry of the pygmy hippopotamus and reproductive issues faced by this endangered species in captivity. Computational methods for determining how agents (e.g. people, computer systems, etc) can reach desired knowledge through the communication of information. How to optimize the role of indwelling pleural catheters in the treatment of malignant pleural effusion. Exploring the potential neurological mechanisms of developmental coordination disorder and more specifically, a behavioural and fMRI investigation of mirror neuron system activation. Investigating how pulsed magnetic field stimulation affects the brain and the mechanisms underlying its clinical effects as a treatment for various neurological disorders. Upper limb function in Parkinson’s Disease after neuromodulation. How Hakea Prostrata metabolically adapted to extremely low phosphorus availability. Analyses how ‘success’ is constituted in Singaporean women’s commercial lifestyle blogging through persona, femininity projects and intimacy. Investigating the late Permian in Eastern Australia; a magnetostratigraphic profile across the Permian-Triassic boundary and implications for global correlation. Effects of plant secondary compounds on reproduction in female sheep. Investigating carbon cycling dynamics in mangrove sediments and how they might respond to climate change and coastal development. Implementing cognitive bias modification training procedures at the onset of heightened anxiety as a means of reducing symptoms. Studying the genetic adaptation of Yellow Lupin to dryland conditions. Identifying, describing and treating voice abnormalities in preterm children at school age. Determining the relative roles of viruses and bacteria in acute lower respiratory infections in young African children. Examining the cellular and molecular aspects of the testes in underfed rams. Examining the science fiction novels of Jeff Noon from an edocritical (environmental) perspective. Investigating how ambiguous loss associated with mental ill health is perceived and managed by those affected. Deriving the consequences of the removal of the statutory individual bargaining stream, like the Australian Workplace Agreements (AWAs), for those in the Western Australian context. Identifying predictive markers of human ooctyte developmental competence, by comparing treatment outcomes between in vitro maturation and traditional in vitro fertilisation, for women with Polycystic Ovarian Syndrome. Investigating trunk and hip neuromuscular control during change of direction sporting tasks and their implications for knee loading and injury prevention. Developing robust design approaches for spudcans (foundations for mobile drilling rigs) directly from cone penetration test data in multi-layer soils. Investigating the ability of those with Parkinson's disease to understand the facial expressions of others. Developing a novel geothermal or waste heat-driven desalination technology for an economic freshwater production. Investigating the effects of Vitamin D deficiency on airway remodeling in asthma. Modeling brain tumour growth using hybrid cellular automata and its effect on the surrounding brain tissue. Studying the effects of salinity on the distribution of blue whales and the prey off southern Sri Lanka. Investigating the strategies employed by the Wajarri people to manage resource availability in the Weld Range, Murchison WA. Developing an optical imaging technique that creates high-resolution images based on the mechanical properties of tissues. Identifying the community effects of climate change on coastal reef ecosystems. Determining the effect of muscle accretion on the reproductive performance of merino ewe lambs. Examining the role of objectification in the development of body shame and eating disorder symptoms in young children. Assessing the effectiveness of periodically-harvested marine reserves in Fiji to conserve local fish stocks, with particular focus on how the duration of harvests impact on this effectiveness. Developing a drought-tolerance screening test of Brassica rapa seedlings at reproductive stage. Investigating the evolutionary history and population connectivity of coral reefs in WA to provide reef managers with the scientific information necessary to plan the placement of Marine Protected Areas. Developing quantitative muscle ultrasonography for assessment of muscle pathology in children with spastic cerebral palsy. Developing a process of efficient computational model generation for image-guided brain surgery. Investigating how rocky structures on beaches can protect and/or make coasts more vulnerable to climate change over a range of spatial and temporal scales. Elucidating the association between the responsiveness to therapy and genetic variations in gene families (e.g. dopamine genes) that are involved in the reward mechanisms or metabolising pathways in patients addicted to illicit drugs (e.g. heroin) with different ethnicity. Assessing and modifying biases in cognitive processes that underlie addictive behaviour. Researching techniques for achieving limb alignment in total knee replacement surgery, comparing conventional techniques with computer-assisted surgery. Investigating the direct and indirect consequences of landscape modification and alien plant invasions on ecosystem processes and biodiversity across the increasingly blurred interface of managed landscapes and natural forest fragments. Defining the natural history and clinical management of the CDKL5 disorder. Investigating ocular imaging as a potential technique for early detection and monitoring of Alzheimer's Disease. Examining the properties of stem cells isolated from human milk and their potential to be used in regenerative medicine and treatment of neonate diseases. Investigating the impact of whole school sustainability education on the attitudes, behaviours and environmental knowledge of upper-primary student. Investigating reproductive physiology in the white rhinoceros, towards new insights for enhanced breeding success in captivity. Testing Einstein's theory of relativity using microwave frequency standards. Performing a study of medieval intellectual history, namely the symbolism of water in medieval thought. Investigating the reorganisation of motor areas of the brain associated with the restriction of sensory input to the brain. Developing a highly sensitive, quantitative and cost-effective method to detect malaria-transmitting cells in human blood. Researching Post-Cold War politics in the Asia-Pacific and the rise of globalisation: an ethnographic exploration of Filipino transnational activism. Characterising and managing fungal pathogens associated with crown and root diseases of strawberries in Western Australia. Understanding how the herpes virus persists within the host. Performing numerical modeling of pipeline seabed interactions. Investigating the structure and function of mechanosensitive ion channels using spectroscopy and simulations. Improving treatments for patients with malignant pleural effusions. Evaluating public health containment strategies for control, prevention and surveillance of infectious diseases using an individual-based simulation model. Performing semiologic analysis of geographical markers in popular songs as representation of national identity. Conducting an integrated study of personality dispositions' motivation processes in exercise with the goal to develop more effective exercise interventions. Studying indoor reactive chemistry through computer modeling using the MCM protocol adapted by inputs from field study observations. Visiting California to learn state-of-the-art techniques for studying the reproductive ecology of kelps. Investigating the influence of genetic and environmental effects in the developmental origins of health and disease with respect to the insulin-like growth factor (IGF) pathway. Developing and validating a family history screening instrument to support chronic disease prevention in primary care. Exploring the theatrical works of Don Delillo. Investigating the potential role of fibroblast growth factor (FGF-9) in malignant pleural mesothelioma. Identifying mechanisms underlying treatment efficacy for remediation of bauxite residue deposits with a view to improving environmental outcomes. Integrating optimisation methods with empirically validated knee modelling techniques to estimate risk of ACL injury at the subject level. Investigating the structure and function of mechanosensitive ion channels using spectroscopy and computer simulations. Devising an adaptive approach for electronic fraud detection in highly dynamic environments. Researching children's theatre and the role of the imagination. Combining geological and geophysical modelling tools to improve understanding of geothermal systems. Investigating the immunogenetics of asthma exacerbations in children. Identifying prognostic features of melanoma in the Western Australian melanoma health study. Using computational modelling to estimate muscle forces and joint loads to predict risk of injury. Investigating the effects of advertising prescription antidepressant medications direct to the public. Identifying adaptation mechanisms of grass peas to water-deficit conditions. Investigating the role of pentatricoptide repeat proteins in organelle gene expression in plants. Evaluating the implementation and health impacts of the Western Australian Government's "Liveable Neighbourhoods Community Design Code". Investigating the psychological factors that maintain eating disorders. Creating realistic 3-dimensional visual environments for accurate assessments of how visual cueing affects movement patterns and knee injury risk. Investigating the role of micro-RNAs in the progression and metastatic spread of colorectal cancer, using both cell-like and human tissue models. Investigating the link between early life exposure to arsenic via drinking water and non-malignant lung disease. Evaluating the effectiveness of a system for monitoring wellbeing in inpatient psychiatric care. Investigating the representation of changes to Finnish national identity in the films of Aki Kaurismaki. Investigating sperm competition and the evolution of sperm storage organs in male anurans. Assessing muscle pathology using optical coherence tomography. Developing magnetic fluids for the treatment of retinal detachment. Investigating the immunogenetic determinants of impaired measles vaccine responses in young children. Exploring shamanistic elements in the works of Zimbabwean writer Dambudzo Marechera. Developing an exercise program which incorporates goal-setting techniques and motivational interviewing to increase physical activity levels. Investigating the interaction of Neisseria meningitidis with host cells, focusing on the role of the lipooligosaccharide of the bacteria and receptors found on the human nasopharyngeal epithelium. Investigating the roles of alternative oxidase in plant growth and development. Investigating the effect that auditory feedback has on the horn player’s production of sound. Developing a full body kinematic model that can empirically test and determine if and how upper body biomechanics influence knee loading and risk of ACL injury. Examining the management competencies required by employers of business undergraduates in Australia and UK, how these align, if at all, with the views of tertiary educators, and the extent to which graduates typically possess the required levels of these attributes. Investigating the evolution and ecological importance of olfaction (i.e. smell) in seabirds and its implications for conservation. Investigating abnormal meiosis in Brassica-interspecific hybrids. Investigating the impact of timing, dose and pattern of prenatal alcohol exposure on fetal development and health. Investigating the function and significance of the growth of aquatic adventitious roots in response to inundation for plant survival during flooding. Performing baseline chamical measurement of atmospheric composition and air quality in WA. Synthesising novel analogues of 3,4-Methylenedioxymethamphetamine (MDMA) for evaluation as drug candidates for the treatment of Parkinson’s disease and Burkitt’s lymphoma. Studying innate immune responses of preterm infants to coagulate-negative staphylococci and related Toll-like receptor agonists. Investigating the application of penetrometers in characterization of deep water soft soils. Accurately modeling riser-seabed interaction and subsequently safely predicting the fatigue lives of steel catenary risers. Undertaking an in-depth study of Sporadic Inclusion Body Myositis (SIBM), attempting to deepen our understanding of susceptibility genes, genotype-phenotype correlations and ultimately, the pathogenesis of disease. Studying responses of skirted shallow foundations under combined transient and sustained uplift loading for offshore applications. Investigating the effects of the clinical use of a method of brain stimulation (tDCS) that has therapeutic potential for enhancing rehabilitation of patients following brain injury, with movement disorders and/or neurological deficits. Investigating the location and distribution of nickel and other metals in the structures of iron oxides, and the effects of heating on the location and distribution of nickel. Investigating the protective roles of dietary polyphenols and their metabolites against atherosclerosis in both human and animal models. Examining properties of our new logic ROTCL*, such as its computational complexity. Discovering unrecognized cat allergens to accurately define the full spectrum of cat allergens and determine their clinical significance in order to improve the diagnosis of cat allergy and subsequent immunotherapy. Investigating the effect of glucose on neurocognitive functioning in adolescents. Isolating and chemically elucidating mycotoxins produced by toxigenic Western Australian Fusarium species associated with cereal and pasture species. Examining seed ecology and biogeography of vernal pool ecosystems in Western Australia. Identifying the causal agent and conditions conducive towards strawberry root and crown disease in Western Australia. Studying parasitic wasps associated with decomposing remains in Western Australia and their potential as indicators of post-mortem interval in forensic investigations.